Ultherapy – Will It Dissolve My Dermal Fillers? Home » Ultherapy » Ultherapy Toronto – Will It Dissolve My Dermal Fillers? Ultherapy Toronto – Will It Dissolve My Dermal Fillers? Many patients love the results they get from Botox and Dermal Filler treatments, yet they still want that extra lift that injections alone cannot do. Ultherapy is a non-invasive ultrasound treatment used to lift and tighten loose skin on areas such as the eyebrows, jawline, and jowl area. 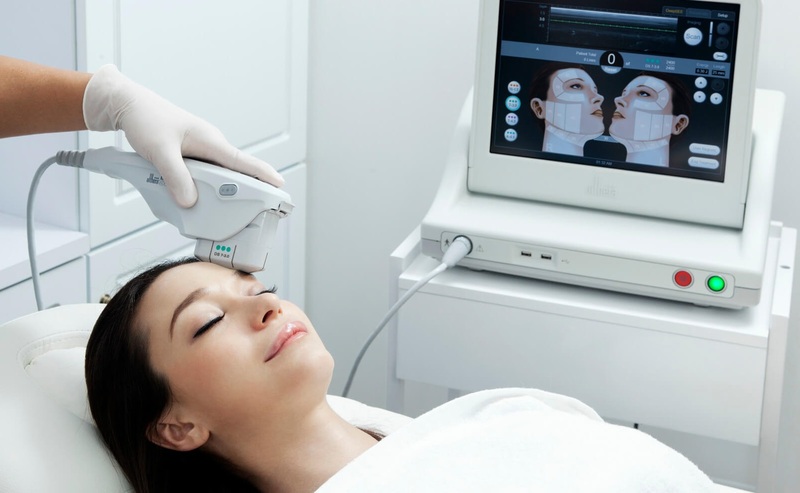 Ultherapy uses focused ultrasound to heat the targeted tissue below the skins surface, stimulating the production of collagen causing a skin tightening effect. Ultherapy treatments does not add volume to the skin; Ultherapy works to tighten the tissue, while dermal fillers replace volume in the cheeks, nasal folds, eye area and jawline. The combination of these two treatments can provide an impressive non-surgical facelift. The question whether Ultherapy dissolves dermal fillers is yet to be fully answered. At the present, there are no actual studies performed where patients who received dermal fillers, and then had an Ultherapy treatment, saw changes with their dermal fillers. It is probably wise not to experiment, as Ultherapy uses ultrasonic focused energy at 3-4.5 mm below the skin surface. This is the same depth that dermal fillers are generally placed. It is possible that patients that have had dermal fillers such as Teosyal, Juvederm, Restylane can experience mild filler degradation if they had their filler treatment completed prior to an Ultherapy procedure. The recommendation would be to do the Ultherapy treatment first, and then next week have the dermal fillers injected. For example, if one is having an Ultherapy brow lift procedure, then having cheeks or lips treated with fillers on the same visit is acceptable. Another benefit of having Ultherapy done prior to dermal filler injections is that Ultherapy results are usually seen after 3–6 months allowing patients to then decide which areas could use dermal fillers.